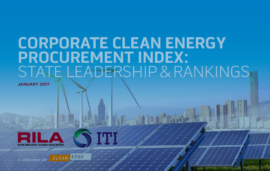 EQ Research contributed data to the Corporate Clean Energy Procurement Index released by The Retail Industry Leaders Association (RILA), the Information Technology Industry Council (ITI) and Clean Edge. The new analysis ranks all 50 U.S. states on the ease with which America’s most recognizable brands can procure domestic renewable energy such as solar or wind for their operations. Retail and tech companies such as Amazon, Apple, Facebook, Google, Microsoft, Target and Walmart are among nearly half of the Fortune 500 companies seeking to locate operations in states with ready access to clean-energy sources. While created on behalf of RILA and ITI, the index is broadly applicable to many stakeholders, including other business sectors, the military, higher education, and state and local government. It is intended to assist policymakers and large RE buyers in advancing policies that help, not hinder, RE development, and help large RE buyers to select states in which they may make RE investments. Click on the link to the left to download the report.